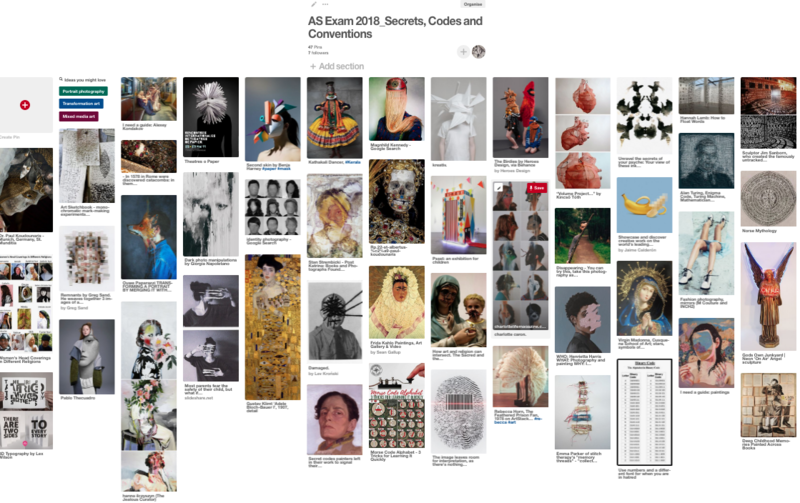 Secrets, Codes and Conventions is the 2018 title for the AS Fine Art exam project (Unit 2). You will have a period of 8-10 weeks (plus the Spring half term and Easter holiday) to develop your ideas through preparatory studies before spending a day in the Art department realising your final outcome as part of the 10 hour, controlled assessment. You should aim to be ambitious in your final outcome and presentation. The exam paper is full of ideas to help you get started. Your art teachers will also set class and home work tasks that will enable you to have the best start possible for your exam project. Make sure everything is documented clearly in your sketchbook. Use this to illustrate your initial responses to the theme (eg. mind map). We will come back to this once the set tasks are complete. Keep adding to your pin board over the course of the project. You will see more and more AS students and teacher boards on Pinterest as the project progresses. You now need to develop three strands of investigation on the theme of STRUCTURE. Use your pinterest board to help you create a VISUAL mind map and explain. Develop a page for each strand that further explores your initial thinking. Begin to collect visual and other materials that are going to establish the bedrock of your brilliant investigation. Visit relevant exhibitions to support your strands. Pick your theme wisely. This is the most important project so far! Pick a theme you feel interested in and can follow up your interest through a sustained investigation.